For those looking for your typical "Adam Sandler" movie, this one isn't quite it. You might be expecting to see Sandler playing some crazy character like the spoiled and immature Billy Madison, or the ferocious Happy Gilmore, or even the repressed and mentally unstable Waterboy. Instead, in this movie, and as has been common of his more recent films, Sandler for the most part plays the straight man, while co-star Jack Nicholson is the one a bit off the wall. Sandler plays and easy-going, non-assertive young professional who ironically is sentenced to "Anger Management" therapy and is placed under the wing of Dr. Buddy Rydell (Nicholson) who seems to be the one with the real issues. It is your typical "who is the doctor and who is the patient" plot that has worked so well with such great movies as What About Bob?, which is one of my personal favorites. Unfortunately, however, the Sandler-Nicholson combo doesn't quite live up to the hype. While I laughed several times, and found the basic premise of the movie quite amusing, I simply got bored in certain spots and just cringed at its unbelievably cheesy and corny ending where Sandler proclaims his love at a baseball game. You know what, we've seen that one before. It was called The Naked Gun, which was MUCH, MUCH funnier. Another aspect of the film that we've seen before a lot lately is the whole theme of yelling at your boss (check out American Beauty, Fight Club, Office Space, etc.). I can understand why this is popular as no doubt many moviegoers are frustrated with their superiors and enjoy the vicarious experience of standing up to him/her. I make no judgement here, just an observation. 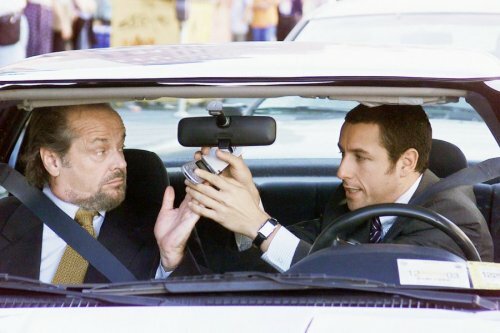 One scene I DID really enjoy, and has been growing on me since, is a scene in which Dr. Rydell forces Buznik (Sandler) to stop his car during Rush Hour over the bridge to Manhattan. He then insists that they sing "I Feel Pretty" together before continuing on to work. This highlights what I really love about both actors. With Nicholson, you never know what he is going to do next, which is just great. And Sandler here used his "nervous-and-unsure-of-himself" act to a tee. I also enjoyed seeing Marisa Tomei again, for obvious reasons. She is perhaps the most beautiful actress I've ever seen. And she is a great actress at that (who could forget her Oscar-winning performance in My Cousin Vinny?). Here she plays Sandler's girlfriend who is getting tired of waiting for him to assert himself both in his career and in their relationship. All in all, I did enjoy the movie, but can't really recommend seeing it in the theater, especially at today's ridiculous prices. And at the speed with which movies nowadays come out on video/DVD, you can definitely wait for this one. I thought it was funny. I laughed. But at the same time, I didn't hurt myself from laughing like I do at Austin-Powers-type movies. 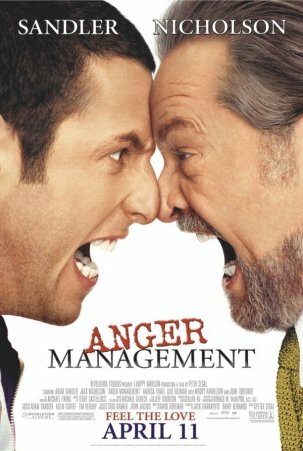 How would you rate the movie Anger Management? There have been 13142 people to visit this page since Fri, Apr 11, 2003. And you are the first person to visit this page today!